They say that to get good players in to your club, you have to pay a premium for them. This may be one of the biggest premiums in trade history. Chad Wingard is an All-Australian contending forward/midfielder who averages a goal and 20 disposals a game. He’s currently under contract, and Hawthorn clearly came in willing to pay a massive premium to secure him, including reportedly throwing in one of their brightest young key contributors on the trade table without his knowledge and having to convince him to move. Ryan Burton has already become a productive contributor for Hawthorn in a defensive role – not just getting games on future promise, but already producing at a level above most players his age. He doesn’t need to be rated highly on future promised improvement but simply on continuing at his level. 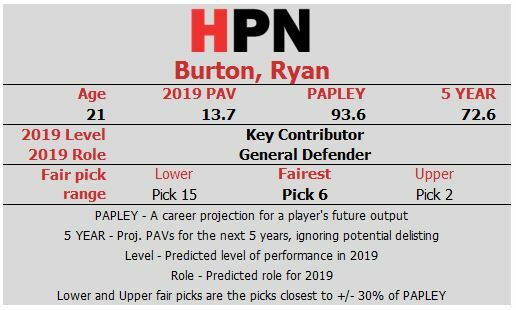 Burton was Hawthorn’s highest rated defender (in defensive PAV terms) in 2017, the year he was Rising Star runner up, and in 2018 expanded his upfield contribution. While not quite as bright as last year, his 2018 season, at age 21, he was in the top 25% of all age 21 seasons in our database. He’s a pretty safe bet to at least keep performing at a good AFL level from here. The thing to emphasise here is that young players with established senior roles who are already performing well for their age project to have long, successful careers. They should be considered very valuable commodities at the trade table because, at low risk, they can remove the need to fill a best 22 list spot for up to a decade at worst. The two player cards above show how this may play out. 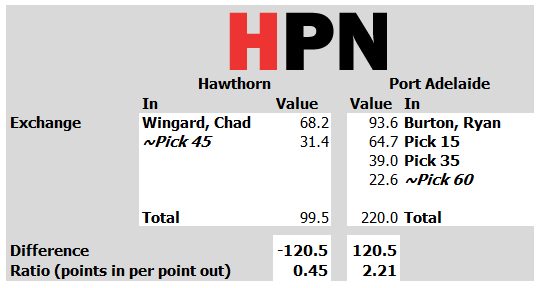 Wingard is really quite a good player right now, and will likely be better for the next few years. Our projection of 68 PAV reflects in the fact that some really good players in their mid 20s fade away early (whether due to form or injury issues). 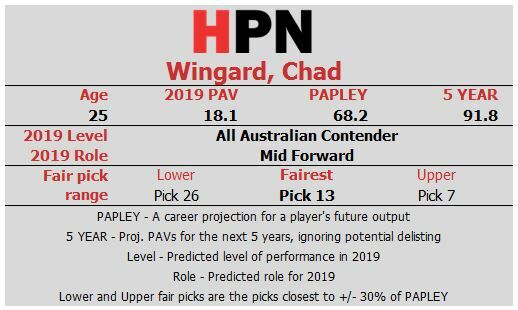 But, if he doesn’t retire before the year he turns 30, Chad Wingard is projecting to produce 92 PAV over the next five years. That’s more than Burton’s five year projection, but Burton will likely have an extra three or four or so years of his career. Burton may not ever be as good as Wingard at his peak, but he has a fair shot of scaling those heights. The sheer volume of career that Burton has in front of him is what makes it fairly likely that when the final accounting on the swap is done years down the track, he’ll have given more than Wingard will have done. It shouldn’t be surprising, then, that the trade looks quite lopsided. Even if we assume Wingard massively outperforms his projection and lives up to the best future outputs of similar players at his age, Burton is a very valuable piece coming the other way who doesn’t even need to really improve from here to be worthwhile. 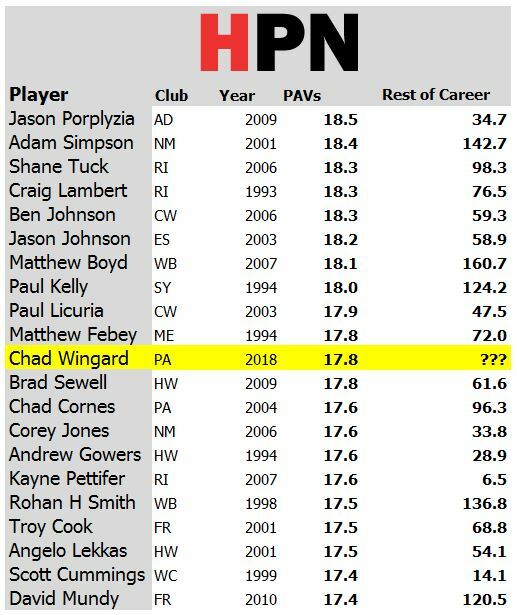 The players most similar to Wingard at age 25 went on to produce an average of 75 PAV for the rest of their careers, with a sharply diverging set of players in the group. A quarter earnt more than 100 further PAV, which is what Hawthorn will be banking on. The draft picks also give Port Adelaide plenty of value in return, including some much needed flexibility lost in the swap with Fremantle. The picks ensure Port Adelaide have an extra shot inside the top 20 as well as a reasonably worthwhile pick inside the top 40. That probably positions them for future pick swaps to climb the draft board further, right up until live pick swaps on draft night. Verdict: Unfair Trade. The trade strongly favours Port Adelaide. Previous Post:Could Taylor be un-Duryea-ted?